Subject: Test Release 4.7.5 of JMRI/DecoderPro is available for download. This is the fifth in a series of test releases. We expect this series to end in the next JMRI production release around the middle of 2017. (See the tentative release schedule) This test release is the last in the series to contain big, new features and changes; the next few tests releases (up until the production release) will contain just incremental fixes and improvements. This version of JMRI (and all later) writes a slightly streamlined version of panel file contents. Older files should still be readable by this version of JMRI, but files written by this version may not be readable by versions before JMRI 4.2 depending on their contents. The LocoNetOverTCP server has changes that may break scripts that reference it. Scripts refering to the class jmri.jmrix.loconet.loconetovertcp.Server need to refer instead to jmri.jmrix.loconet.loconetovertcp.LnTcpServer. Since JMRI 4.3.3 You can now set the order of your startup items: If you're opening panel files, running scripts, etc as the program starts up, there's a preferences pane that lets you easily set the order in which those happen. If you've set the order manually (e.g. by editing configuration files) in the past, please check this preference to make sure it's set the way you want. Since JMRI 4.1.1 Decoder definitions that use the "ivariable" form are now deprecated. Definitions included with this release have been converted to the new form. If you have decoder definitions with the older "ivariable" form, they will no longer validate, but can still be used for the first couple of test releases in this series. Please ask on the JMRI Users group for help converting them, or just drop them and use the current definitions. The Single CV Programmer now supports Ops Mode Accessory Programming (Program Accessory Decoder on the Main). *Please advise if your system does not work, preferably by creating a new issue on GitHub. We may be able to help. Some additional work on the multi-connection support. JMRI should be able to support mixed sets of cable connected (e.g. serial) C/MRI and network connected C/MRI by defining multiple connections. The LocoNet Download Firmware tool has been updated to report an error when reading a firmware download file which is for a device which requires special LocoNet message timings which are not supported by this tool. Using the wrong protocol would corrupt the device's firmware and require factory repair of the unit. This change prevents this tool from corrupting the firmware of devices including the DCS210, DCS210, DB210, DB210-Opto, and DB220. The Digitrax program DigiIPLII.exe may be used to perform firmware updates for these devices. The LocoNet Download Firmware tool has been updated to provide slower timings which improve the success-rate of firmware updates, including the UR92. The tool was also improved to prevent other GUI operations from inadvertently interrupting a progressing firmware update. 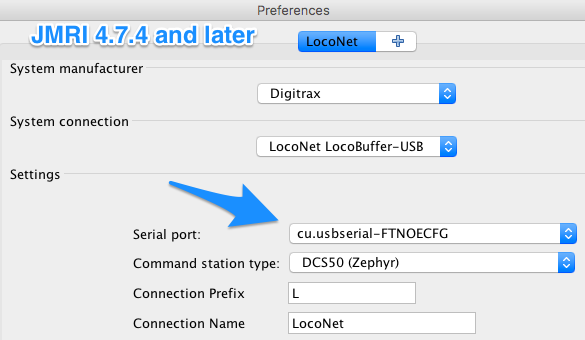 LocoBuffer, LocoBuffer-II, and LocoBuffer-USB connections may be configured as "Standalone LocoNet" connections. LocoStats Monitor was corrected to display only "interface status" LocoNet messages. 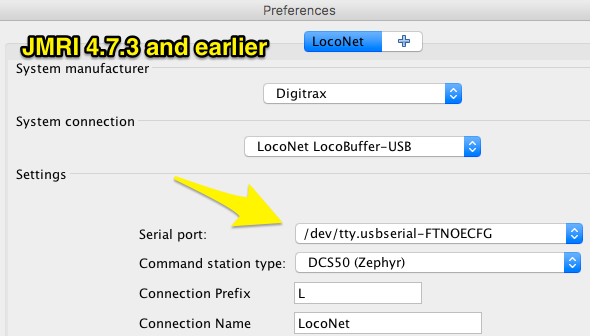 The SPROG command station code has been updated to fix an issue whereby users had observed very slow packet update rates on the rails causing locos to become unresponsive. In JMRI 4.7.3, we added support for SE8c Signal Heads listening to the layout and (attempting to) follow messages that are happening there, so that if something other than JMRI changed the SE8c-shown color, the JMRI icon(s) would follow. That didn't work right, so we fixed it in 4.7.4, and fixed it again. But we now understand that it can never really work right, there's not enough information in the SE8c hardware messages. To prevent this from causing problems, we've removed that message-following, so the SE8c SignalHead in JMRI itself is now back to as it was in JMRI 4.7.2 and before. But in case somebody is willing to work through the imperfections to do something like this our their own layout, we've added a new jython/FollowSE8c.py sample script, along with a test case that shows you how it works.